Ocean Ridge Plantation is a premier golf club community located in Ocean Isle Beach, North Carolina. Ocean Ridge is a gated community that began development in the early 1990's and now offers new and resale homes throughout the community. Upon completion, Ocean Ridge Plantation will have 3,000 single-family homes in over a dozen neighborhoods. Homebuyers can choose from spacious estate homes or charming cottage homes. The amenities at Ocean Ridge Plantation are ideal for rest and relaxation beginning with The Plantation Club, a luxurious private club located on a four-acre fishing lake. This clubhouse is exclusively for Ocean Ridge residents and has spectacular lake views. Homeowners can gather here with friends and neighbors for barbeques at the outside grill area, work out in the fitness center, or take a dip in one of the indoor or outdoor pools. There is even a sauna and two lighted tennis courts. Residents bask in the Carolina breeze along the Atlantic Ocean with the private Ocean Ridge Beach Club. Located just three minutes from the gates of Ocean Ridge Plantation on Sunset Beach this exclusive club has a three-story clubhouse with gorgeous outdoor decks. Homeowners can use the indoor showers, dressing areas, bathrooms, and beach-side lounge. There is also private parking and a kitchenette ideal for summer beach days. Ocean Ridge Plantation is home to the nationally recognized Big Cats golf courses. These courses are the Tiger s Eye, Panther s Run, Lion s Paw, Leopard's Chase, and Jaguar s Lair. Each golf course has 18 holes of championship golf and have been designed to take advantage of the natural landscape. The Tiger s Eye Grand Clubhouse is 20,000 square feet of luxury that provides executive meeting spaces, a pro shop, and dining at Tiger s Eye Grille. Lion s Paw and Panther s Run share a well-appointed clubhouse that provides another pro shop and dining at Tamers Restaurant and Lounge. Tamers can also cater your next private party or community event. Ocean Ridge Plantation allows residents to take full advantage of the mild Carolina climate with their outdoor amenities. Miles of walking and biking trails gently twist through the community, golf courses, and woodlands. There is a nature park and pavilion available for barbeques and picnics. 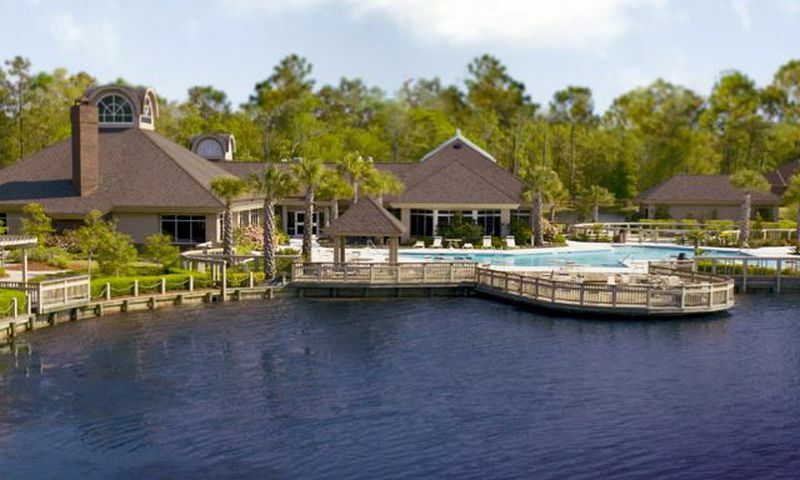 Ocean Ridge Plantation is continuing to provide top-of-the-line amenities for its residents. There are proposed plans to build a kayak and canoe center as well as a tennis and racquetball club. Ocean Ridge Plantation is set along 3,000 acres of beautiful Coastal Carolina land. This luxurious community opened its gates in 1990 and will have about 3,000 single-family homes upon completion. Many homes throughout the community have calming water views or beautiful golf course views. There are over a dozen unique neighborhoods found within Ocean Ridge and each neighborhood has their own size and style. Homebuyers can choose from new or resale homes that range in size from 1,600 to 2,800 square feet. The homes at Ocean Ridge Plantation can also be customized to your very own tastes and budget. With over 50 clubs and organizations residents of Ocean Ridge Plantation can find an activity that sparks their interest. Card groups meet regularly to play poker, bridge, and Bunco. Plenty of events are planned like monthly dinners, bowling trips, and volunteer opportunities. Since staying healthy is key to an active lifestyle, there are plenty of exercise opportunities at Ocean Ridge Plantation. These activities include weight training, water aerobics, and walking groups. Residents can always eat nutritiously with the community gardens. These gardens provide fresh potatoes, cucumbers, apples, grapes, tomatoes, and more. Each resident can even practice using their green thumb with the opportunity to grow their own herbs, vegetables, and flowers. Ocean Ridge Plantation is located in Ocean Isle Beach, North Carolina. This wonderful community is just 45 minutes away from the historic town of Wilmington, North Carolina. Fort-Fisher, Brunswick Town, and the USS North Carolina are a few of the fun historic sites located throughout Brunswick County. Boaters enjoy the convenient location to marinas and public boat ramps found throughout the Intracoastal Waterway. Myrtle Beach, South Carolina is just 25 minutes south of Ocean Ridge Plantation and offers boundless opportunities for musical entertainment, dining, and world-class golf. The Plantation Club is available exclusively to the residents of Ocean Ridge Plantation. The Ocean Ridge Beach Club is a private clubhouse on Sunset Beach available to the residents of Ocean Ridge Plantation. It is just three miles away from the gates of the community. With a membership to the Big Cats golf courses, Ocean Ridge residents can golf and access The Tiger's Eye Grand Clubhouse. The Tiger's Eye Grand Clubhouse - 20,000 Sq. Ft.
Panther's Run is the second Big Cats golf course and was designed by Tim Cate. The Lion's Paw Golf Course was designed by architect Willard Byrd. The breathtaking scenery makes this Big Cats golf course a favorite of Ocean Ridge's residents. As the most recent addition to Big Cats golf, Leopard's Chase awarding-winning course features 18 holes of championship golf. Jaguar's Lair is converting its 36 holes of championship golf to 18 with a major redesign by Tim Cate. There are plenty of activities available in Ocean Ridge Plantation. Here is a sample of some of the clubs, activities and classes offered here. Upon completion, Ocean Ridge Plantation will have 3,000 single-family homes. There are many diverse neighborhoods that have their own design and common size. These beautiful homes range in size from 1,600 square-foot garden homes to 2,800 square-foot estate homes. Architectural styles range from traditional, Southern Low-Country to Mediterranean styles. Homebuyers can select from resale or new construction residences. You can also purchase homesite and build your dream home that fits your own taste and budget. Ocean Ridge is paradise for anyone who loves the outdoors. We belong to Big Cats too and golf a lot too. We love Sunset beach and all the trails. Staying active is very important to us and we love all the options to get out and do things here. We also enjoy the community garden and the huge nature preserve (over 300 acres I believe). We don't fish on the lake but it is beautiful to look at! 55places.com is not affiliated with the developer(s) or homeowners association of Ocean Ridge Plantation. The information you submit is distributed to a 55places.com Partner Agent, who is a licensed real estate agent. The information regarding Ocean Ridge Plantation has not been verified or approved by the developer or homeowners association. Please verify all information prior to purchasing. 55places.com is not responsible for any errors regarding the information displayed on this website.